Rating: 85 percent based on 839 votes. 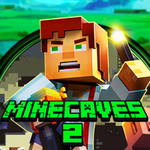 Description: Minecaves 2 is the second installment in the Minecaves series. You have to try and navigate through a maze and collect all of the gems as you try and safely reach the exit of each level. Make sure and avoid traps and obstacles on your journey.